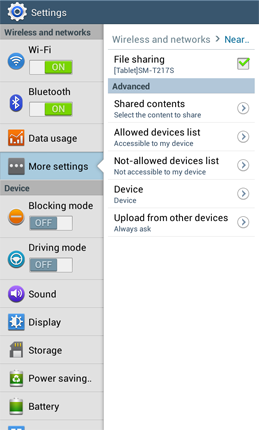 How do I connect to DLNA enabled (Nearby devices) devices using my Samsung Galaxy Tab 3? Your device can connect to and share media with DLNA enabled devices, such as TVs, projectors, and other devices. Or connect to, and play media from your device to DLNA enabled devices. You will receive a request when a nearby device recognizes that you have chosen to share content. Approve access by touching OK, or reject access by touching Cancel. Warning! When you turn on File sharing, any device connected to the same Wi-Fi access point may be able to access and view the content you decide to share. This includes public Wi-Fi access points you may use at a coffee shop or a hotel. It is recommended that you turn off File sharing when it is not in use. From the Home screen, touch Menu > Settings > More settings > Nearby devices. Touch File sharing to mark the checkbox and turn file sharing on. Review the message and touch OK. When the feature is on, a green check mark will be displayed. Touch Shared contents and mark the media you want to share with other devices. Touch Allowed devices list to view devices you have approved access for. You can approve access for up to 10 devices. To remove access for a device, mark the device's checkbox and touch Delete. Touch Not-allowed devices list to view devices you have rejected access for. If you decide you want to approve a device, mark the device's checkbox and touch Delete. The next time the device is in range, you will receive an access request again. Touch OK to approve access. Touch Device and select the preferred storage location for media you download from other devices. Touch Upload from other devices to select how your device should handle requests to upload content from a remote device. Choose from Always accept, Always ask (default), or Always reject. How to start Remote Management for Smartphone?